We're used to seeing plenty of leaks in advance of major smartphone launches, but it seems even action cameras are getting in on the act now - a few days ago we heard a few details about the upcoming GoPro Hero6 range and now some extra information has spilled out on the web. According to a source in Canada reporting to The Verge, the Hero6 Black will indeed feature 4K recording at 60 fps (double the rate of its predecessor). The new packaging shots also suggest moviemakers can look forward to slow motion 1080p footage at 240 frames-per-second, or 10 times slower than real life. What's more, it sounds like GoPro will be switching to a custom processor for the new model, the GP1, which may give its engineers the chance to boost battery life or image quality. A new version of the Karma stabilizer grip is also apparently on the way. Based on some website digging done by developer Konrad Iturbe, the Hero5 Black and Hero5 Session will remain on sale, as will the Fusion 360-degree camera - the only new model will be the Hero6 Black, becoming the new flagship GoPro camera for 2017. Most rumors point to an announcement happening on September 28 and the new model could well go on sale the same day, so mark your calendars accordingly if you want to pick up the new model. The Verge is quoting a CA$649 price in Canada, which lines up with around US$499 before tax (roughly £365 or AU$625). 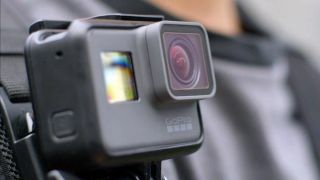 There hasn't been much in the way of official statements from GoPro as yet, though back in February the company did confirm that a new Hero6 model would appear this year. As the Hero5 range launched in September 2016, the rumored September 2017 for the new camera would make sense.